KAMPALA– Kyaddondo East Member of Parliament Robert Kyagulanyi Ssentamu aka Bobi Wine has responded to President Museveni’s article to the media dissecting several issues the president raised and offering alternative views to how to perceive present socioeconomic and political state of affairs In the country. In a July 10 letter President Museveni tackled a wide range of issues on the economy, the youth, polices–especially the recent by-elections–and the media. But writing on his Facebook page, Bobi Wine, a musician turned – politician whose thumping victory in Kyaddondo East by-election left the President more embarrassed than bemused, dissected the President’s letter issue by issue, greeting with some points raised while differing from others lecturing Museveni on what ought to be. If there were any doubts that Bobi Wine has arrived on the political scene, then this letter put them all to bed, in effect, saying a boy who has washed his hands can eat with the elders. The MP starts at a canter in what would no doubt leave many a President qho writes such a missive wincing. He accepts Museveni’s congratulations for he victory, but from a distance to rather Han a hug, stressing out the implication of the by-election win. “For emphasis, it is not me who won but rather the ideas which I presented to the electorate. It was especially a victory of a people determined to get involved in how they are governed,” Bobi Wine says. 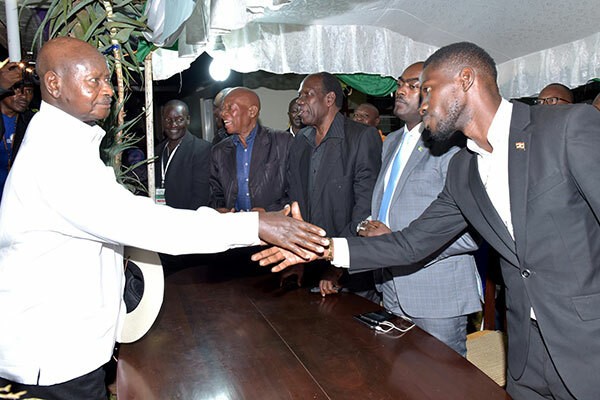 In his missive, Presidenr Museveni talked about NRM party ideology, suggesting that the ruling party had created a fertile ground for even youth from the ghetto like Bobi Wine to be able to compete and win. “It is to the credit of the NRM that our slum-dweller children can today even make it to Parliament because those avenues are there,” Muzungu said. The President was acerbic while tsking issues with media coverage of the by-elections, complaining that when the NRM wins the by-elections, the press, including the New Vision, are not happy. Museveni tool further issues with the media, claimin thar the press misleads the people, especially the youth. After the Kyadondo by-election, for instance, the news-papers at least, spent alot of space and time talking about the youth but in a defective and confusing way, he said. “Our esteemed editors and news persons need to know that when we talk about the management of society, we are not talking about biology only but also about ideology. What is the ideological position of those youth or those elders? Youth or elders are biological categories. They will not help society by themselves,” Museveni said. But Bobi Wine, whilst appreciating the President’s stance, has an altogether punchy view. “You seem to suggest that the NRA/M ideology is superior and forget that as society evolves better ideas crop up and they should be given opportunity to flourish,” he says in his letter. On media and its coverage of elections, Bobi Wine, who was sworn in last week, said what happened in Kyadondo East was not a reflection that the media had been ‘freed’. RESPONSE TO PRESIDENT MUSEVENI’S ARTICLE ON THE RECENT BY-ELECTIONS. Mr. President, I have read your article dated 10th July, 2017 on the recent by-elections. I thank you for congratulating me on my victory in the Kyadondo East polls. For emphasis, it is not me who won but rather the ideas which I presented to the electorate. It was especially a victory of a people determined to get involved in how they are governed. While I agree with some aspects of your article, I don’t agree with many of the conclusions you draw. For example, I agree that unemployment, corruption, increased levels of crime and leaders not connecting with the population are serious issues. These are not mere gaps but are grave questions of national importance which must be addressed. I am constrained to respond to some of your points, mainly three. On its part, the Supreme Court while noting that this issue has been recurrent, held that state owned media failed to give balanced coverage to all presidential candidates as required by law. Therefore, despite the progress made with regards to media freedom, the NRM gets more coverage on a daily. What happened in Kyadondo East was not a reflection that the media had been ‘freed’. It was partly because of the extra ordinary nature of that election that print and digital, local and international media widely covered it. Our campaign inspired the people, even beyond the constituency, because we correctly diagnosed the problems of our society, understood people’s frustrations and identified with their struggles. In the process we were able to effectively suggest practical solutions to improve the conditions of our people. Although you would have wished to see the NRM and its candidate dominate headlines, the media should be balanced while reflecting the wishes and aspirations of the people, which is what our campaign offered. The press could not be expected to headline stale ideas which people had rejected. I therefore applaud them for rejecting intimidation and other machinations to fulfil their duty to society. Secondly, Mr. President, in your article, you talk about the question of ideology versus biology and the role of youth in politics. In sum, your argument is that the solution to society’s problems lies in ideas and not in the physical/ biological state of the actors. This is indeed true but my point of departure lies in so far as you seem to think that the present young people lack in ideology. You seem to suggest that the NRA/M ideology is superior and forget that as society evolves better ideas crop up and they should be given opportunity to flourish. Even then, the NRM hasn’t fared very well with what you identify as the core principles of your ideology- patriotism, Pan-Africanism, social-economic metamorphosis and democracy. Many would agree that these are noble ideals, the problem being that the NRM prefers to constantly talk and sing about them and not practice them. Had you fully implemented them no doubt our society would be much better. You have laboured to point out leaders who rose to positions of responsibility in their youthful years and did great harm to society. You give examples of Ssekabaka Mwanga, Ssekabaka Mutesa II, Obote, Ibingira, Amin and John Kakonge. I definitely DISAGREE on your conclusion here. As a student of Uganda’s constitutional history, I know that the crises our society went through in the past years were caused by many factors beyond the leaders of the times. Because of constraints in time and space I will not discuss them here. However, while it is true that correct ideology overrides biology, the biggest question is ‘WHAT IDEOLOGY?’ You rightly point out that the electorate is losing interest in issues of identity of religion or tribes as basis for electing leaders. Again, rather than look at it as an achievement of your government, I think of it more as a natural result of our population demographics and their struggles. Our society is more blended today as a result of intermarriages between people from different backgrounds(I am an example). You note that 78% of our population comprises of youth. Many of them are unemployed or underemployed. The hustle for them is real. They have to make ends meet and are definitely uninterested in chauvinism of any kind. I do not want to say that you do not fully understand this but it is rather troubling how you choose to downplay it. Our society has moved on and new issues are emerging. The generation of the 1960s and 1970s had to respond to challenges of that time and we are grateful to those of you who rose to the occasion and played a role. However, the challenges of our time require a new kind of ideology and approach. We are talking about a generation where technology is evolving at a terrific speed. A generation which must struggle with the effects of climate change! Today’s generation has to deal with complex issues in science and technology. Young Africans must find out what economic models work best for their times and work hard to improve the living conditions of our people. As someone who has interacted with so many of these young Ugandans, I know that they have great ideas on how to get there or at least have some idea which simply needs an enabling environment for it to blossom. I do not think that Ugandan youth or Africans generally have a gene for slowness or stupidity. As someone who has led an African country for over three decades, you might be better placed to explain why youth on other continents are inventing and innovating useful products every day, for which we pay a lot of money. Part of the problem has been that the NRM views money as the solution to everything in itself. Only God knows how many funds you have put in place for innovation, prosperity, etc. only for them to fail flat. In any case most of that money is lost through corruption. We must rethink our education system. Those UPE and USE schools might not help the situation in their current state. Now, almost all these young people were born when you were President and they unfortunately have to put up with a system which tries to respond to challenges of the 21st century using the approaches of the 20th century! Their ideas are viewed as disruptive and discomforting. They are not understood by the leaders most of whom are out of touch with the world reality. They could no longer afford to see government only through its officials who drive through the ghetto in their expensive, guarded vehicles with tinted glasses, moreover paid for by tax payers. My humble view Mr. President is that those who govern us today should first of all appreciate the fact that the TIMES HAVE CHANGED and involve young people in making decisions for their country. This ‘lack of proper ideology argument’ has been used far too long to keep them outside. This is a contradiction given that in the initial years of your government, most people in leadership were just over 30 years of age. Key government positions were occupied by young men and women who in their prime were able to do a lot of good things for the country. Most Ugandans would find it unbelievable that at only 36 Suleiman Kuggundu (RIP) was Governor Bank of Uganda, Gen. Mugisha Muntu was Army Commander at 31, Dr. Kiiza Besigye was deputy minister for internal affairs and national political commissar at 30, Dr. Crispus Kiyonga was minister for finance at 34, etc. I am mindful of the contribution of those who were slightly older and society needs both the old and the young. Elders are capable of providing wise counsel. However, younger people with vigour and fresh ideas should be given opportunity to take the lead. Therefore rest assured that many young Ugandans are able and in fact ready to steer their country forward. It would be better if they are given the opportunity, PEACEFULLY, and without requiring the country to go through turmoil whenever one generation has to pave way for another. It is for this reason that I join most Ugandans to request that you stick to your promise and not tamper with the Constitution to remove the age-limit provision for presidency. The country will be grateful for your service when you retire peacefully and let a new breed of leaders with generation-relevant skills and ideas take charge of the affairs of our mother land. The first category is the hardliners whose stance is that everything about Uganda is wrong. I do not subscribe to that notion because in seeking a way forward for a better country, we must be willing to talk to each other, being aware that all of us have our failings. Uganda today does not need these two kinds of leaders. It simply needs principled leaders who engage with respect for each other and only for the good of the country and not for their own benefit. There are very many such Ugandans. We should only give them opportunity. Finally on the question of our supporters heckling you at Zirobwe Road junction, I hope you are aware of the events of that day. Whereas I do not condone violence or bad politics, many times our people are provoked by state agencies. On that day my supporters were charged because we were supposed to hold our rally in Kasangati and the police decided to unlawfully block me from holding it there because you were expected in the area. That said, Mr. President, you must also note that some of this conduct comes out of deep seated frustration and anger by the people about how they are governed. A powerless, suppressed people may heckle a Head of State simply because that’s the only opportunity they ever got to have their leader listen to them since the government is very far from them. I think that is the message you should read in those people who heckled you. Today they have no guns but many feel as oppressed as you felt in 1981. A tired people using whatever tool with in their power to express their discontent. Hopefully we can rethink these things and all of us strive to build a better country.